As April showers were encouraging spring flowers, your Area Directors with the help from the host Clubs were busy hosting fun and informational Area Spring Workshops. 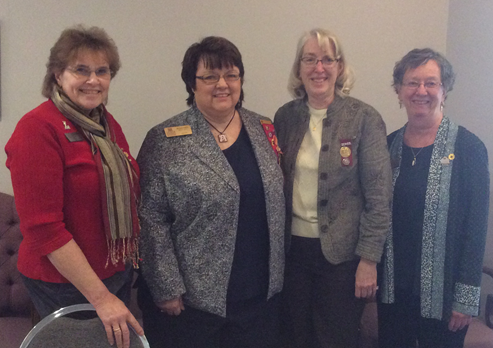 Over 160 Zontians participated in Zonta networking, receiving information from District officers on Membership, ZISVAW projects, Zonta Leadership, and ZI updates. They heard about human trafficking and agencies offering help to individuals who have suffered from that awful activity. Area 1 members mixed shopping with service by purchasing $700 worth of items made by women recovering from trafficking. Each Workshop focused on PR and the media. Many notes were scribbled and questions explored on interacting with print, broadcast, and social media. Hopefully, several new ideas and resources will arise from this education. Be prepared to share any successes in this area at District Conference. As I attended each Workshop, I was impressed by the energy and sharing amongst participants. Thank you’s go out to the Host Clubs: Chicago Loop, Beloit, Lincoln, Indianapolis, and Belvidere. You did a great Job! You displayed flexibility (think venue flooding in Indianapolis), enthusiasm (think all new Lincoln Club members in attendance), and hospitality. I even learned about Horseshoe and Pony shoe sandwiches at a Friday night social gathering in Lincoln (think heart attach on a plate). For those of you who couldn’t attend this year, you missed a great opportunity to learn more about Zonta and network with fellow Zontians. Please make attending next year’s Workshops (renamed “fun”shops in Lincoln) a priority! This entry was posted in Notes from the Governor. Bookmark the permalink.